Formulated for all skin types, Osmosis Colour Pressed Base provides a flawless, semi-matte finish with long-lasting natural to full coverage. Natural broad-spectrum UV protection keeps the skin protected from both UVA and UVB rays helping to prevent premature aging and hyperpigmentation. 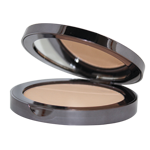 Osmosis Colour Pressed Base applies quickly and easily with no mess and is packaged in a stylish, mirrored refillable compact. For yellow and olive undertones, use shades of Golden. Deeper shades are recommended for honey or red/brown undertones. This product is amazing. I first used it about 2 years ago when my estheticion recommended it and I never used anything else again. I have oily, problematic skin and have been fighting breakouts for a long time and this is perfect coverage. Not only is it good coverage but it helps my skin heal. I love the fact that it has ingredients that are not harsh. I was so happy to find this product online here since they don't sell in stores. I have recommended this foundation to everyone I know (no joke). I covers perfectly you will never need to use liquid foundation again. I'm 23 and I used to wear full coverage cover up all the time. I like Osmosis more than Bare Minerals, Estee Lauder Dual Coverage, Makeup Forever..... It beats everything. I also use the Osmosis Concealer which I also love. Highly recommended!! !